Perma Eazee Coat SP is a milky-white liquid, which can be brush-applied to most of the structural surfaces to make them waterproof. The coating is UV stable, highly flexible and is a superior quality product. Premium chemicals are used to make Perma Eazee Coat SP. Our Perma Eazee Coat SP is made by the experts. Thus, Perma Eazee Coat SP has accurate composition and waterproof surface quite efficiently. 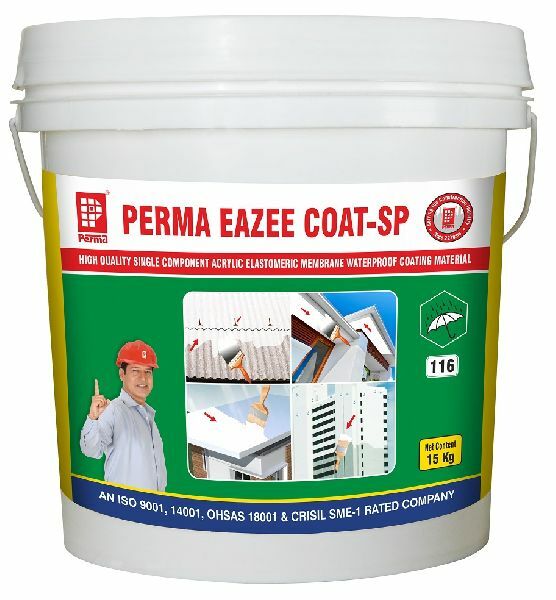 Perma Eazee Coat SP is used for waterproofing all types of RCC surface such as roofs chajjas, parapet walls and external walls. Asbestos cement sheet roof can also be waterproofed using scrim cloth or nylon mesh at the junction, overlaps and J âï¿½ï¿½ bolts as reinforcement. As a damp proof course, Perma Eazee Coat SP is applied under the first layer of bricks or blocks in masonry works. Because of the high quality of the product it can be used as final coat on many vertical surfaces after using a roller brush for the desired texture. Perma Eazee Coat SP is applied directly from the can. Perma Eazee Coat SP cures to give a permanently flexible and resilient smooth surface' resistant to a wide range of temperature. No cleaning solvents are required and it can be washed off with water when it is still wet. Can be used on wet surface and during rainy seasons. Mechanical damages to the membrane can easily be repaired by spot application. The membrane allows the concrete surface to breath. Seamless application no joint are required. Can be applied with ease to a desired texture using a roller. Waterproofing normal concrete : Clean the surface to remove all loose particles and any deleterious matter. It repairs all cracks, honeycombs and blemishes from the concrete surface. Brush-apply Perma Eazee Coat SP primer on the entire surface liberally. Perma Eazee Coat SP is prepared by diluting one part by volume of 'Eazee Coat - SP with one volume of water. When the primer coat is just 'dry apply one coat Perma Eazee Coat SP. When this coat is still wet provide fibre glass, scrim fabric or nylon mesh' reinforcements at junctions of vertical and, horizontal surfaces. Then apply second coat of Perma Eazee Coat SP so as to get an even and smooth finish or roller applied textured surface as desired. On asbestos sheet roofing : Provide scrim cloth, fibre-glass fabric or nylon mesh, at J.blots and junction of sheet over one coat of Perma Eazee Coat SP and then brush apply Perma Eazee Coat SP on the entire surface in two coats. Note : Stir the material well in the container before use. Shelf Life : Perma Eazee Coat SP has a shelf life of 18 months if stored in Manufacturer's' original packing in a cool and dry place away from moisture and heat. Statement of Responsibility : Perma branded products when used in accordance with its current published directions for use performs as per its datasheets/catalogue. The Manufacturer and the distributor will not be responsible for other materials and conditions of inferior workmanship.